A corneal abrasion occurs when there is a loss of cells from the epithelium or surface of the cornea. It is usually due to trauma but may occur without trauma such as with the overuse of contact lenses . The cornea is the clear curved structure found at the front of the eye. It is comprised of three layers and the membranes that separate these layers. It is very difficult to penetrate past the epithelium or top layer of the cornea. The cornea is normally devoid of blood vessels yet has many sensory nerves. When any trauma to the corneal epithelium occurs, cells are lost or destroyed and pain is immediately sensed. When a corneal abrasion occurs, the conjunctiva, or the white of the eye, turns red, as new blood vessels form and those present enlarge, in an attempt to increase blood flow to the eye as it attempts to bring to the eye those cells needed for the healing of the cornea. A corneal abrasion heals by the movement of neighboring epithelial cells, which slide over the wounded area, and through a cell division process called mitosis, which fill in the abraded area with new epithelial cells. Within two to three days of trauma to the cornea, these new cells start to adhere to the underlying membrane of the epithelium, called the basement membrane and within seven to eight days the abraded area usually heals completely without scarring. But if a corneal abrasion is deep and penetrates the next layer of the cornea, then scarring is possible and complete healing of the abrasion may be delayed as long as three months. Corneal abrasions account for 10 percent of ocular emergency care. The incidence of non-penetrating injuries to the eye, which includes corneal abrasions, is 1.57 percent per year. More males are treated for corneal abrasions than are females. Common causes of corneal abrasions include fingernails, make-up implements, paper cuts, plant material, including tree branches, animal scratches, cigarettes, inverted eyelashes, and blunt trauma, such as that with a knife or with scissors. Children are most likely to get a corneal abrasion while playing, while adults are more likely to sustain an abrasion in the workplace. Ultraviolet radiation such as that which occurs with a welder's flash or use of a sunlamp, can also cause an abrasion, as well as misuse and mishandling of contact lenses. When a missile type object causes an abrasion, the object can become embedded in the cornea or penetrate the eye. Pain, irritation, tearing, red eye, twitching of the eye, decreased vision, and sensitivity to bright lights are common complaints that accompany a corneal abrasion. If there is significant swelling of the cornea, then vision may be decreased. If there is inflammation inside the eye, a dull ache may be felt inside the eye. Very rarely, nausea is experienced due to the pain associated with a corneal abrasion. The only symptom in a nonverbal patient, such as an infant, may be that the child is fussier than usual. Any redness or foreign body sensation, especially if only one eye is affected, should be evaluated promptly for a corneal abrasion. If a corneal abrasion is not treated appropriately, scarring and ulceration of the corneal are possible. A corneal abrasion should be treated by a healthcare practitioner capable of evaluating eye conditions. Herpes simplex , recurrent corneal erosion (RCE), and acanthamoeba infections are other conditions that can mimic a corneal abrasion but which require very different treatments. The individual with a corneal abrasion will usually report a known trauma to the eye area. To diagnose a corneal abrasion, a topical anesthetic with a yellow dye called flourescein is placed into the eye. Under blue cobalt light, the part of the cornea abraded will be stained by the dye and is easily seen by the examiner. The area and depth of the abrasion can be easily seen under a special microscope called a slit lamp biomicroscope. If a microscope is not available, then a blue light called a Burton lamp may be used. Usually the anesthetic drop will relieve the ocular pain immediately. If a dull aching sensation persists after this instillation then a co-existing iritis, or inflammation of the iris, also called a uveitis, may also be present. When a biomicroscope is available, the eye is checked for infection or inflammation. The eyelids are everted (turned out) to check for any foreign bodies. These areas may also be rinsed with saline to remove any small foreign body that may be a source of the abrasion. If any of the instilled dye leaks into the eye, then the cornea has been perforated and a small projectile may be inside the eye. Other testing, such as x rays , must be done to rule out foreign bodies inside the eye. Since metal is the most common material seen in penetrating injuries, an MRI is not usually done. If the cornea has been perforated, then the patient is referred to a corneal specialist for surgery. If an infection is suspected or if an abrasion does not heal, then swabbing of the eye for microscopic culture may be done to definitively establish the organism involved. If the corneal abrasion is very small and superficial, then the application of mild antibiotic drops three to four times a day for a few days to a week is sufficient to prevent an infection. At bedtime, an antibiotic ointment, which will remain on the eye longer, may be necessary for deep abrasions. When an infection is present, then specially compounded fortified antibiotics , formulated specifically for the organism that caused the infection, are prescribed topically. For those with very minor abrasions, instillation of non-preserved lubricating drops a few times a day for a few days may be all that is required. The pain of a corneal abrasion can be treated with drugs such as homatropine which keep the eye in a dilated state and stop the spasm of the iris, a major cause of discomfort for the individual with a corneal abrasion. Nonsteroidal drops, called NSAIDs, may also be prescribed for a few days to relieve the pain. In some instances, oral analgesics may be prescribed, but children under 12 should not be given aspirin. If the area is large and there is no underlying viral infection, then a mild steroid to decrease future scarring and treat an associated iritis may also be needed. Topical anesthetics are never prescribed because they delay and interfere with the healing process. For many years the standard treatment for a corneal abrasion included patching. Patching can decrease blinking, which was thought to speed the healing process. But patching is as of 2004 no longer done routinely because it decreases the amount of oxygen that gets to the cornea. Patching is never done for contact lens patients, whose eyes are at a greater risk of a Pseudomonas infection, nor when the cause of an abrasion is due to vegetative matter, such as a tree branch. Organisms can thrive in these types of environment. Patching is also not done for patients who are monocular (have one good eye), if the better eye has the abrasion, nor for patients for whom depth perception is important, as this is lost when only one eye is used. Controlled studies have demonstrated that patching a corneal abrasion does not improve healing either in children or adults and that patching of an eye may make walking difficult. For the contact lens wearer with a corneal abrasion, contact lens wear must be discontinued for at least one week and glasses must be worn. Patients who wear contact lenses are given antibiotics that act on the bacteria that are ubiquitous in the eye of the contact lens wearer. The eye must be evaluated by an eye-care practitioner prior to reinstituting contact lens wear. For the patient with a large abrasion and without an infection, and who does not wear contact lenses, a bandage contact lens approved for extended overnight wear may be worn. The pressure of the contact lens may comfort the patient, and the antibiotics are absorbed by the contact lens, giving the eye continuous 24 hour protection from a potential bacterial infection. Treatment of a corneal abrasion with over-the-counter (OTC) drugs advertised to decrease redness should not be used to self treat corneal abrasions. These drugs act by constricting the blood vessels in the eye, decreasing the blood supply to the eye and delaying healing. Also, the preservatives in these drops may irritate the cornea. Except for a very mild abrasion, the doctor may require daily follow-up examination to ensure that the abrasion is healing. This is especially important if vegetative matter is the cause of the abrasion. Those who have been patched must be re-evaluated within 24 hours to see if the symptoms have improved. Corneal abrasions usually heal within a week, but complications can occur. A secondary infection and scarring can result if the abrasion is not treated. Up to 50 percent of those with a corneal abrasion develop a uveitis or inflammation inside the eye. Epithelium —The layer of cells that covers body surfaces, lines body cavities, and forms glands. Pseudomonas —A bacterium which can cause ulcers in contact lens wearers. Uveitis —Inflammation of all or part the uvea. The uvea is a continuous layer of tissue which consists of the iris, the ciliary body, and the choroid. The uvea lies between the retina and sclera. Approximately 10 to 25 percent of those with corneal abrasions will develop recurrent corneal erosion (RCE) a condition in which the epithelium of the cornea pulls off because it did not heal properly or completely. This can happen weeks, months, or years after the initial trauma. Usually the patient either awakens with sharp pain or is bothered by a foreign body sensation that is worse in the morning. This erosion is usually treated conservatively with lubricating drops and hypertonic saline ointment for a month or more, although some patient need a debridement of the cornea or laser treatment. Oral doxycycline and topical steroids have been shown to help with the restructuring of the cornea with a RCE. 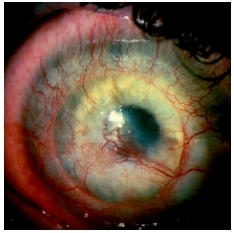 A close-up view of an abrasion on patient's cornea. The probability of corneal ulcer development from a corneal abrasion increases tenfold in contact lens wearers for those who use extended wear contacts, over those who remove their contacts as night. This risk may be decreased for those wearing the new silicone contact lenses. Prevention of a traumatic injury or an accident is not possible, but for those types of abrasions caused by chronic trauma, such as with contact lenses, the likelihood of abrasions and subsequent ulcers can be reduced by proper contact lens wear and care. It is important that children and adolescents who wear contact lenses have glasses to wear and that glasses are worn every day to give the eyes a chance to breathe. The contact lenses should be replaced and cared for as recommended by an eye care practitioner. For those who engage in welding, eye protection, including the use of helmets, decreases the incidence a corneal abrasions caused by welding burns . Rarely do corneal abrasion lead to loss of vision, but any trauma to the eye must be evaluated by a healthcare practitioner for the possibility of an abrasion. When an abrasion is present, then it is imperative that prescribed treatment, including cessation of contact lenses and use of prescribed drops be followed. If the corneal abrasion is due to contact lens abuse, then the consequences of further misuse of contact lenses must be thoroughly discussed with the eye care practitioner. Hersch, Peter S., et al. "Anterior Segment Trauma" in Principles and Practice of Ophthalmology , edited by Daniel M. Albert, et al. Philadelphia: Saunders, 2000. Scoper, Stephen V. "Corneal Abrasions, Lacerations, and Perforations" in Current Ocular Therapy , Vol. 5, edited by Frederick T. Fraunfelder. Philadelphia: Saunders, 2000. Michael, Jeffery G., et al. "Management of Corneal Abrasion in Children: A Randomized Clinical Trial." Annals of Emergency Medicine 40 (July 2002): 67–72. Rittichier, Kristine K., et al. "Are Signs and Symptoms Associated with Persistent Corneal Abrasions in Children?" Archives of Pediatrics and Adolescent Medicine 154 (April 2000): 370–74. Trad, Michael J. "Pressure Patching Indicated in Few Cases of Traumatic Corneal Abrasions." Primary Care Optometry News 9 (September 2004): 36–37. An opthomologist said my wifes constant tearing is a symptom of dry eye.Is this right?Your article says nothing about dry eye.My wifes problems are further complicated by sclera derma.Is there any chance her eyes will improve?